"Did Evaluation Kill My Singing Career?" 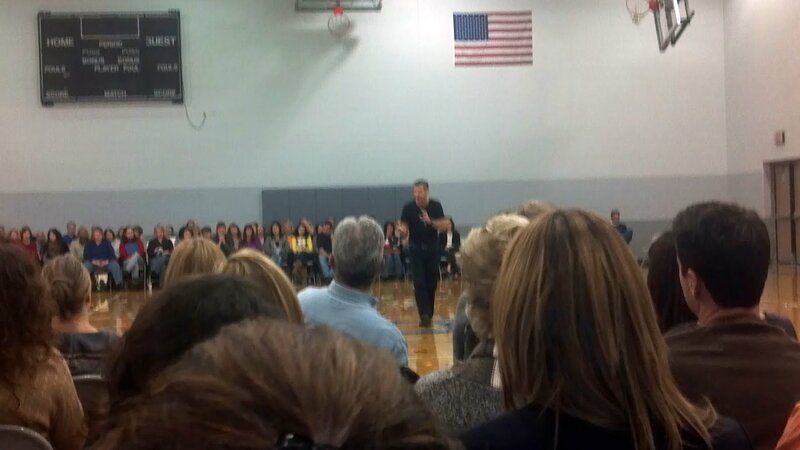 My wife and I spent last Friday night listening to a motivational speaker, Eddie Slowikowski. If you are a runner, then that name might be familiar to you - Eddie is one of the few individuals in the world that has run a sub four-minute mile. Fleet footwork aside - his primary message was that it takes belief, a positive attitude, and hard work to achieve success and overcome life's inevitable setbacks. He also stressed that we as parents and educators need to help children assess their unique abilities and help them turn their passion into a life's ambition and adventure. His next point sent my mind spinning into memories, as well as, instructional thought. Eddie said, "Did anyone notice that I did not ask if you did any of these things well?" "Everyone can sing, draw, and dance to a certain extent." He explained that when he asks these same questions to a group of young children, they all stand with excitement, eagerness, and anticipation that they will get to demonstrate their "rad" skills. Eddie went on to explain what I already suspected, that once we start to get evaluated, our vision, our belief, and our self-concepts change. We develop a more rational mind that tries to protect our egos from disappointment and embarrassment. I enjoy music, and I would love to be able to sing. But at some point, when I was much younger, I was told that I could not sing well, and I shifted my pursuits to sports and other "boyish" things. Conversely, it wasn't until the past few years (I am 48) that I discovered that I have a talent, and a passion for dancing. Fortunately, my wife suports my passion. We have taken several ballroom dancing classes, and we go country line-dancing almost every weekend - it is amazing how, after hours of practice - that we can anticipate, and "feel" an upcoming movement. Natalie doesn't "believe" that she is a good dancer, but she is a fast learner and she loves music. She does very well on the floor until she thinks that she is being watched, or judged. Maybe someone doubted her dancing ability when she was young. Most significantly, Natalie is an outstanding and passionate 2nd grade teacher. It is because of these combinations of our passions and skills that I can picture us teaching dance lessons sometime in our future. I remember my parents dancing in our family room to their old collection of 45s. I remember the music being loud - they looked good, and they were having a lot of fun. They tried to get my me and my brother to join in - but maybe we were too embarrassed, or maybe we felt silly. I guess I just finally got to an age where I no longer care about embarrassment, or about being judged. Maybe it took me a few decades to learn that life is best lived when we pursue and enjoy those activities that we feel passionate about. Then miraculously, the hard work doesn't feel like work at all! These concepts can be applied to grading policies in our classrooms. We need to keep in mind that kids have unlimited potentials - they can do anything, more importantly - they think they can do anything! We cannot let an evaluation system smother a child's passion. After all, if you look closely at a school report card, I will bet you a quarter that somewhere on that form are the words, "PROGRESS REPORT". So, in the true spirit of a progress report, each student would have an IEP (individualized education plan). Each student would be allowed to establish a baseline of aptitudes, abilities, and interests. Each student would then be allowed to frequently self-evaluate their progress towards challenging standards. Parents and teachers would observe the children, learning about them while recording and sharing areas of particular skill, interest, and passion. Am I saying that we need to get away from a letter grade evaluation system? Yes, I am! What else am I saying? The same thing that Eddie Slowikowski was saying. We can accomplish great and rewarding things when we identify our passion and then believe and commit to endeavors, and efforts that foster and support those passions. My singing career was derailed early on - probably for the best. However, my teaching / coaching career has been very rewarding and satisfying. There is nothing better than helping students form, and then work towards, goals that they are passionate about. My next career, who knows? It may be as a writer, or a dance instructor. Either way, much like teaching, it will be an interesting and fun adventure. Thanks for sharing your message and your passion Eddie - we heard you!